Over the past 22 years my team and I have been able to settle hundreds of cases ranging from car accidents, to nursing home abuse, to wrongful death suits and every kind of personal injury in between. 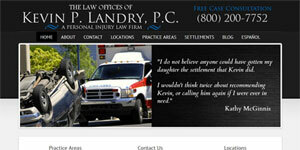 I personally stay in touch with each of my clients from the initial phone call all the way to the final settlement. I’d like to take this opportunity to thank all of my past and current clients and I look forward to the personal injury clients I am yet to meet.